If you are facing a divorce, you might feel like the rug has been pulled out from under you. You feel unsteady and uncertain, knowing that things will never be the same. 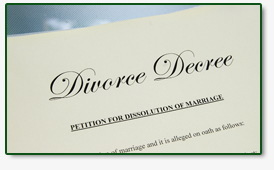 At Cherf and Greenup, P.C., we serve as your dedicated advocates throughout the entire divorce process. Our 35 years of legal experience allow us to strategically assess your options and pursue the course of action that best effectuates your wishes. We take a practical, cost-effective approach to divorce and family law matters. If that means conducting most of our work at the negotiation table, we will. If defending your interests and your future leads us to the courtroom, we will aggressively represent you at trial. In any situation, you can be confident that we will knowledgeably, compassionately and diligently pursue any and all advantages that the law provides you. We are on your side, every step of the way. The lawyer you choose makes a difference. Trust us to protect your financial and parental rights in any divorce, child custody, child support or any other important family law issue. Call us at 586-774-2222 or contact us online to schedule a free initial consultation. Cherf and Greenup, P.C., represents clients in St. Clair Shores and the surrounding Michigan communities, including Grosse Pointe, Mount Clemens, Eastpointe, Sterling Heights, Shelby Township, Troy, Rochester Hills, Port Huron, Detroit, Clinton Township, Warren, Birmingham, Bloomfield Hills, Royal Oak, Chesterfield Township, Madison Heights, Macomb County, Wayne County, Oakland County and throughout southeast Michigan.